The main campground on Big Bear Lake lacks a boat ramp as well as the privacy usually associated with state forest campgrounds. But the Mackinaw State Forest campground does have one feature most other units would be hard pressed to match; a beautiful beach only a few steps from your site. The clear water of the lake combined with the sandy strip at its north shore is no doubt the reason for its popularity. But escaping is easy, even in July, because the campground also serves as the trailhead to a state forest pathway. Big Bear Lake Pathway is a 2.5-mile trail system of two interconnected loops with most of the trail north of the Bear Lake Road. Departing from east end of main campground is the 1.8-mile Eagle Roost Loop, from the west end the 1-mile Beaver Lodge Loop. Combine them beginning from the campground’s day-use area and you have a pleasant 2.6-mile hike away from the bustle of campers, boaters and swimmers. The trail is also referred to as the Big Bear Lake Nature Pathway due to the fact that it winds past three marshy ponds with two of them active with beavers. There are no interpretive signs or brochures to accompany hikers but in early morning or at dusk the pathway often rewards them with wildlife sightings. Although there are no numbered posts at junctions as are displayed on older DNR maps, Big Bear Lake Pathway is well marked by blue blazes and pathway markers and easy to follow. Big Bear Lake Pathway is open to mountain biking but due to its limited mileage most off-road cyclists prefer riding nearby Buttles Road Pathway. In the winter this would be an excellent trail for snowshoers. The main trailhead is posted near in the day-use parking lot at the east end of Big Bear Lake Campground. Eagle Roost Loop begins by skirting Big Bear Lake for 200 yards before swinging inland within sight of a private cabin. The hike turns hilly at this point, the result of the kettles left behind by glacial activity, and at Mile 0.4 you descend to the edge of Mink Pond, the marshy bottom of a kettle. It’s debatable if anybody ever sees a mink here but the beaver activity is hard to miss. The pond usually features a pair of lodges. From the pond the pathway ascends to a power line right-of-way which quickly merges into Snowmobile Trail 448. During the summer the snowmobile trail appears like a sandy two-track and you follow it for a third of a mile before the pathway veers west (left) back into the forest at a well-marked spot. A dip into another kettle follows and at Mile 1 you pop out at the paved Big Bear Lake Road. On the other side the pathway winds through a red pine plantation that has been thinned at some point and now the ground cover includes some extensive blueberry patches. 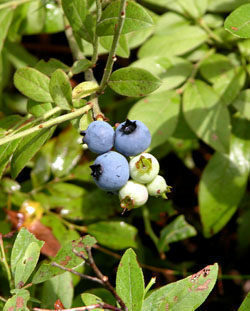 Keep one eye on the ground for these dark blue jewels, they begin appearing in mid-July. At Mile 1.4 you arrive at the junction between the two loops and are so close to Big Bear Lale Road you can hear traffic rumbling by. Head left to quickly return to the campground along Eagle Roost Loop. Head right to continue with Beaver Lodge Loop. This loop begins by skirting a marshy pond and then at Mile 1.7 climbs over a low ridge to emerge at Beaver Pond, the largest of the three ponds by far. 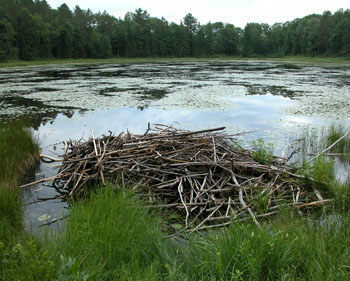 So is its beaver lodge on the west side that appears like a small temple of sticks. Beaver Pond usually supports three lodges and if you’re timing is right the residents of them can sometimes be seen swimming from one side to the other. The pathway skirts the pond for a brief spell and at Mile 2 then swings away and briefly merges with an old two-track. Within a quarter mile you pop out at Big Bear Lake Road for the second time and at Mile 2.3 arrive at the west end of the main campground. It’s a third of a mile walk through the campground to return to your vehicle at Mile 2.6 and the day’s been hot it’s hard to pass up the beach along the way for a cool dip in the lake. 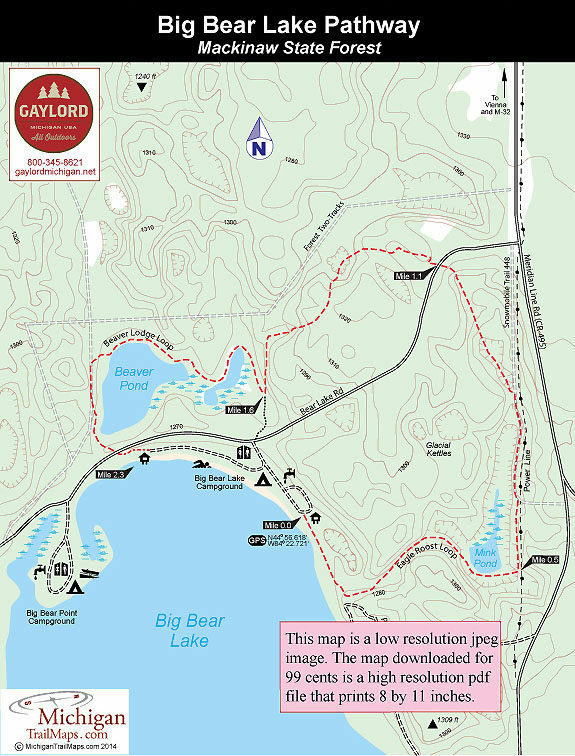 There are actually two campgrounds on Big Bear Lake each with their own entrance off Bear Lake Road. The main campground is called Big Bear Lake and has 31 sites on the northeast corner of the lake with 17 of them overlooking the beach and 11 of them large enough to accommodate 40-ft trailers. The area is lightly forested in hardwoods with little undergrowth thus the lack of isolation from your neighbors. 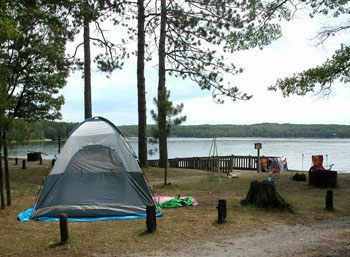 Big Bear Point Campground is on the northwest corner of the lake and has 14 sites in a thicker forest and heavier brush. Not only do these sites offer more privacy but four of them are situated on a low bluff with a scenic view of the entire lake. There is also a boat launch at the point. A small day-use area is situated along the beach in the main campground and has tables and a parking area. The beach is nice with a sandy bottom that gently slopes towards the deeper sections of the lake. Big Bear Lake Campground is popular and from mid-July to mid-August you might have difficulty getting a site on a Saturday afternoon or even Friday evening. There is a nightly fee for campers but none for day users who arrive just to enjoy the pathway. Getting There: From I-75 depart at exit 282 and head east through downtown Gaylord on M-32. The hamlet of Vienna Corners is reached in 19 miles where you turn south on County Road F-01 for 1.2 miles and then west (right) on Bear Lake Road to the posted entrance of the main campground. Contact the Gaylord office of the Department of Natural Resources (989-732-3541). For snow conditions contact the Gaylord Area Tourism Bureau (800-345-8621; www.gaylordmichigan.net).